Earth mass (ME or M⊕, where ⊕ is the standard astronomical symbol for planet Earth) is the unit of mass equal to that of Earth. The current best estimate for Earth mass is M⊕ = 7024597220000000000♠5.9722×1024 kg, with a standard uncertainty of 7020600000000000000♠6×1020 kg (relative uncertainty 10−4). It is equivalent to an average density of 7003551500000000000♠5515 kg⋅m−3. 19th-century illustration of Archimedes' quip of "give me a place to stand on, and I will move the earth"
The Earth mass is a standard unit of mass in astronomy that is used to indicate the masses of other planets, including rocky terrestrial planets and exoplanets. One Solar mass is close to 333,000 Earth masses. The Earth mass excludes the mass of the Moon. The mass of the Moon is about 1.2% of that of the Earth, so that the mass of the Earth+Moon system is close to 7024604560000000000♠6.0456×1024 kg. Most of the mass is accounted for by iron and oxygen (c. 32% each), magnesium and silicon (c. 15% each), calcium, aluminium and nickel (c. 1.5% each). Precise measurement of the Earth mass is difficult, as it is equivalent to measuring the gravitational constant, which is the fundamental physical constant known with least accuracy, due to the relative weakness of the gravitational force. The mass of the Earth was first measured with any accuracy (within about 20% of the correct value) in the Schiehallion experiment in the 1770s, and within 1% of the modern value in the Cavendish experiment of 1798. The LAGEOS satellite was used to precisely measure Earth's gravity, and therefore, its mass. The GM⊕ product for the Earth is called the geocentric gravitational constant and equals 7014398600441800000♠(398600441.8±0.8)×106 m3 s−2. It is determined using laser ranging data from Earth-orbiting satellites, such as LAGEOS-1. The GM⊕ product can also be calculated by observing the motion of the Moon or the period of a pendulum at various elevations. These methods are less precise than observations of artificial satellites. The relative uncertainty of the geocentric gravitational constant is just 6991200000000000000♠2×10−9, i.e. 7004500000000000000♠50000 times smaller than the relative uncertainty for M⊕ itself. M⊕ can be found out only by dividing the GM⊕ product by G, and G is known only to a relative uncertainty of 6995460000000000000♠4.6×10−5 (2014 NIST recommended value), so M⊕ will have the same uncertainty at best. For this reason and others, astronomers prefer to use the un-reduced GM⊕ product, or mass ratios (masses expressed in units of Earth mass or Solar mass) rather than mass in kilograms when referencing and comparing planetary objects. Earth's density varies considerably, between less than 7003270000000000000♠2700 kg⋅m−3 in the upper crust to as much as 7004130000000000000♠13000 kg⋅m−3 in the inner core. The Earth's core accounts for 15% of Earth's volume but more than 30% of the mass, the mantle for 84% of the volume and close to 70% of the mass, while the crust accounts for less than 1% of the mass. About 90% of the mass of the Earth is composed of the iron–nickel alloy (95% iron) in the core (30%), and the silicon dioxides (c. 33%) and magnesium oxide (c. 27%) in the mantle and crust. Minor contributions are from iron(II) oxide (5%), aluminium oxide (3%) and calcium oxide (2%), besides numerous trace elements (in elementary terms: iron and oxygen c. 32% each, magnesium and silicon c. 15% each, calcium, aluminium and nickel c. 1.5% each). Carbon accounts for 0.03%, water for 0.02%, and the atmosphere for about one part per million. The mass of Earth is measured indirectly by determining other quantities such as Earth's density, gravity, or gravitational constant. The first measurement in the 1770s Schiehallion experiment resulted in a value about 20% too low. The Cavendish experiment of 1798 found the correct value within 1%. Uncertainty was reduced to about 0.2% by the 1890s, to 0.1% by 1930. The figure of the Earth has been known to better than four significant digits since the 1960s (WGS66), so that since that time, the uncertainty of the Earth mass is determined essentially by the uncertainty in measuring the gravitational constant. Relative uncertainty was cited at 0.06% in the 1970s, and at 0.01% (10−4) by the 2000s. The current relative uncertainty of 10−4 amounts to 7020600000000000000♠6×1020 kg in absolute terms, of the order of the mass of a minor planet (70% of the mass of Ceres). Before the direct measurement of the gravitational constant, estimates of the Earth mass were limited to estimating Earth's mean density from observation of the crust and estimates on Earth's volume. Estimates on the volume of the earth in the 17th century were based on a circumference estimate of 60 miles (97 km) to the degree of latitude, corresponding to a radius of 5,500 km (86% of the Earth's actual radius of about 6,371 km), resulting in an estimated volume of about one third smaller than the correct value. The average density of the Earth was not accurately known. Earth was assumed to consist either mostly of water (Neptunism) or mostly of igneous rock (Plutonism), both suggesting average densities far too low, consistent with a total mass of the order of 7024100000000000000♠1024 kg. Isaac Newton estimated, without access to reliable measurement, that the density of Earth would be five or six times as great as the density of water, which is surprisingly accurate (the modern value is 5.515). Newton under-estimated the Earth's volume by about 30%, so that his estimate would be roughly equivalent to 7024420000000000000♠(4.2±0.5)×1024 kg. In the 18th century, knowledge of Newton's law of gravitation permitted indirect estimates on the mean density of the Earth, via estimates of (what in modern terminology is known as) the gravitational constant. Early estimates on the mean density of the Earth were made by observing the slight deflection of a pendulum near a mountain, as in the Schiehallion experiment. Newton considered the experiment in Principia, but pessimistically concluded that the effect would be too small to be measurable. An expedition from 1737 to 1740 by Pierre Bouguer and Charles Marie de La Condamine attempted to determine the density of Earth by measuring the period of a pendulum (and therefore the strength of gravity) as a function of elevation. The experiments were carried out in Ecuador and Peru, on Pichincha Volcano and mount Chimborazo. Bouguer wrote in a 1749 paper that they had been able to detect a deflection of 8 seconds of arc, the accuracy was not enough for a definite estimate on the mean density of the Earth, but Bouguer stated that it was at least sufficient to prove that the Earth was not hollow. That a further attempt should be made on the experiment was proposed to the Royal Society in 1772 by Nevil Maskelyne, Astronomer Royal. He suggested that the experiment would "do honour to the nation where it was made" and proposed Whernside in Yorkshire, or the Blencathra-Skiddaw massif in Cumberland as suitable targets. The Royal Society formed the Committee of Attraction to consider the matter, appointing Maskelyne, Joseph Banks and Benjamin Franklin amongst its members. The Committee despatched the astronomer and surveyor Charles Mason to find a suitable mountain. that of Schiehallion mountain. This corresponds to a mean density about 4​1⁄2 higher than that of water (i.e., about 7000450000000000000♠4.5 g/cm3), about 20% below the modern value, but still significantly larger than the mean density of normal rock, suggesting for the first time that the interior of the Earth might be substantially composed of metal. Hutton estimated this metallic portion to occupy some ​20⁄31 (or 65%) of the diameter of the Earth (modern value 55%). With a value for the mean density of the Earth, Hutton was able to set some values to Jérôme Lalande's planetary tables, which had previously only been able to express the densities of the major Solar System objects in relative terms. The Henry Cavendish (1798) was the first to attempt to measure the gravitational attraction between two bodies directly in the laboratory. Earth's mass could be then found by combining two equations; Newton's second law, and Newton's law of universal gravitation. Cavendish found a mean density of 7000545000000000000♠5.45 g/cm3, about 1% below the modern value. Experimental setup by Francis Baily and Henry Foster to determine the density of Earth using the Cavendish method. While the mass of the Earth is implied by stating the Earth's radius and density, it was not usual to state the absolute mass explicitly prior to the introduction of scientific notation using powers of 10 in the later 19th century, because the absolute numbers would have been too awkward. Ritchie (1850) gives the mass of the Earth's atmosphere as "11,456,688,186,392,473,000 lbs." (7018498951607000000♠1.1×1019 lb = 7018500000000000000♠5.0×1018 kg, modern value is 7018515000000000000♠5.15×1018 kg) and states that "compared with the weight of the globe this mighty sum dwindles to insignificance". Absolute figures for the mass of the Earth are cited only beginning in the second half of the 19th century, mostly in popular rather than expert literature. An early such figure was given as "14 quadrillion pounds" (14 Quadrillionen Pfund) [7024650000000000000♠6.5×1024 kg] in Masius (1859). Beckett (1871) cites the "weight of the earth" as "5842 quintillion tons" [7024593600000000000♠5.936×1024 kg]. The "mass of the earth in gravitational measure" is stated as "9.81996×63709802" in The New Volumes of the Encyclopaedia Britannica (Vol. 25, 1902) with a "logarithm of earth's mass" given as "14.600522" [7014398586000000000♠3.98586×1014]. This is the gravitational parameter in m3·s−2 (modern value 7014398600000000000♠3.98600×1014) and not the absolute mass. 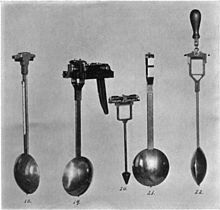 Experiments involving pendulums continued to be performed in the first half of the 19th century. By the second half of the century, these were outperformed by repetitions of the Cavendish experiment, and the modern value of G (and hence, of the Earth mass) is still derived from high-precision repetitions of the Cavendish experiment. In 1821, Francesco Carlini determined a density value of ρ = 7000438999999999999♠4.39 g/cm3 through measurements made with pendulums in the Milan area. This value was refined in 1827 by Edward Sabine to 7000476999999999999♠4.77 g/cm3, and then in 1841 by Carlo Ignazio Giulio to 7000495000000000000♠4.95 g/cm3. On the other hand, George Biddell Airy sought to determine ρ by measuring the difference in the period of a pendulum between the surface and the bottom of a mine. The first tests took place in Cornwall between 1826 and 1828. The experiment was a failure due to a fire and a flood. Finally, in 1854, Airy got the value 7000660000000000000♠6.6 g/cm3 by measurements in a coal mine in Harton, Sunderland. Airy's method assumed that the Earth had a spherical stratification. Later, in 1883, the experiments conducted by Robert von Sterneck (1839 to 1910) at different depths in mines of Saxony and Bohemia provided the average density values ρ between 5.0 and 7000630000000000000♠6.3 g/cm3. This led to the concept of isostasy, which limits the ability to accurately measure ρ, by either the deviation from vertical of a plumb line or using pendulums. Despite the little chance of an accurate estimate of the average density of the Earth in this way, Thomas Corwin Mendenhall in 1880 realized a gravimetry experiment in Tokyo and at the top of Mount Fuji. The result was ρ = 7000577000000000000♠5.77 g/cm3. The uncertainty in the modern value for the Earth's mass has been entirely due to the uncertainty in the gravitational constant G since at least the 1960s.G is notoriously difficult to measure, and some high-precision measurements during the 1980s to 2010s have yielded mutually exclusive results. Sagitov (1969) based on the measurement of G by Heyl and Chrzanowski (1942) cited a value of M⊕ = 7024597300000000000♠5.973(3)×1024 kg (relative uncertainty 6996500000000000000♠5×10−4). Earth's mass is variable, subject to both gain and loss due to the accretion of micrometeorites and cosmic dust and the loss of hydrogen and helium gas, respectively. The combined effect is a net loss of material, estimated at 5.5×107 kg (5.4×104 long tons) per year. This amount is 10−17 of the total earth mass. [better source needed] The 7007550000000000000♠5.5×107 kg annual net loss is essentially due to 100,000 tons lost due to atmospheric escape, and an average of 45,000 tons gained from in-falling dust and meteorites. This is well within the mass uncertainty of 0.01% (7020600000000000000♠6×1020 kg), so the estimated value of Earth's mass is unaffected by this factor. Mass loss is due to atmospheric escape of gases. About 95,000 tons of hydrogen per year (7000300000000000000♠3 kg/s) and 1,600 tons of helium per year are lost through atmospheric escape. The main factor in mass gain is in-falling material, cosmic dust, meteors, etc. are the most significant contributors to Earth's increase in mass. The sum of material is estimated to be 7004370000000000000♠37000 to 78000 tons annually, although this can vary significantly; to take an extreme example, the Chicxulub impactor, with a midpoint mass estimate of 7017229999999999999♠2.3×1017 kg, added 900 million times that annual dustfall amount to the Earth's mass in a single event. Additional changes in mass are due to the mass–energy equivalence principal, although these changes are relatively negligible. Mass loss due to the combination of nuclear fission and natural radioactive decay is estimated to amount to 16 tons per year,[better source needed][dubious – discuss], though these do not on their own change the total mass-energy of the earth. ^ Δοσ μοι που στω και κινω την γην (attributed by Pappus of Alexandria, Synagoge VIII). Engraving from ^^Mechanic’s Magazine^^ (cover of bound Volume II, Knight & Lacey, London, 1824). ^ a b c The cited value is the recommended value published by the International Astronomical Union in 2009 (see 2016 "Selected Astronomical Constants" in The Astronomical Almanac Online, USNO–UKHO ). The recommended value in 1976 was 7024597420000000000♠(5.9742±0.0036)×1024 kg, see IAU (1976) System of Astronomical Constants. ^ a b Pitjeva, E.V. ; Standish, E.M. (2009-04-01). "Proposals for the masses of the three largest asteroids, the Moon-Earth mass ratio and the Astronomical Unit". Celestial Mechanics and Dynamical Astronomy. 103 (4): 365–372. Bibcode:2009CeMDA.103..365P. doi:10.1007/s10569-009-9203-8. ^ Luzum, Brian; Capitaine, Nicole; Fienga, Agnès; et al. (10 July 2011). "The IAU 2009 system of astronomical constants: the report of the IAU working group on numerical standards for Fundamental Astronomy". Celestial Mechanics and Dynamical Astronomy. 110 (4): 293–304. Bibcode:2011CeMDA.110..293L. doi:10.1007/s10569-011-9352-4. ^ a b c d e f g "Planetary Fact Sheet – Ratio to Earth". nssdc.gsfc.nasa.gov. Retrieved 2016-02-12. ^ "The Habitable Exoplanets Catalog – Planetary Habitability Laboratory @ UPR Arecibo". ^ Ries, J.C.; Eanes, R.J.; Shum, C.K. ; Watkins, M.M. (20 March 1992). "Progress in the determination of the gravitational coefficient of the Earth". Geophysical Research Letters. 19 (6): 529. Bibcode:1992GeoRL..19..529R. doi:10.1029/92GL00259. ^ Lerch, Francis J.; Laubscher, Roy E.; Klosko, Steven M.; Smith, David E.; Kolenkiewicz, Ronald; Putney, Barbara H.; Marsh, James G.; Brownd, Joseph E. (December 1978). "Determination of the geocentric gravitational constant from laser ranging on near-Earth satellites". Geophysical Research Letters. 5 (12): 1031–1034. Bibcode:1978GeoRL...5.1031L. doi:10.1029/GL005i012p01031. ^ Shuch, H. Paul (July 1991). "Measuring the mass of the earth: the ultimate moonbounce experiment" (PDF). Proceedings, 25th Conference of the Central States VHF Society: 25–30. Retrieved 28 February 2016. ^ a b See structure of the Earth: inner core volume 0.7%, density 12,600–13,000, mass c. 1.6%; outer core vol. 14.4%, density 9,900–12,200 mass c. 28.7–31.7%. Hazlett, James S.; Monroe, Reed; Wicander, Richard (2006). Physical geology : exploring the earth (6. ed.). Belmont: Thomson. p. 346. ^ Jackson, Ian (1998). The Earth's Mantle - Composition, Structure, and Evolution. Cambridge University Press. pp. 311–378. ^ The hydrosphere (Earth's oceans) account for about 0.02% 6996229999999999999♠2.3×10−4 of total mass, Carbon for about 0.03% of the crust, or 6994300000000000000♠3×10−6 of total mass, Earth's atmosphere for about 6993859999999999999♠8.6×10−7 of total mass. Biomass is estimated at 10−10 (7014550000000000000♠5.5×1014 kg, see Bar-On, Yinon M.; Phillips, Rob; Milo, Ron. "The biomass distribution on Earth" Proc. Natl. Acad. Sci. USA., 2018). ^ a b Poynting, J.H. (1913). The Earth: its shape, size, weight and spin. Cambridge. pp. 50–56. ^ P. R. Heyl, A redetermination of the constant of gravitation, National Bureau of Standards Journal of Research 5 (1930), 1243–1290. ^ Mackenzie, A. Stanley, The laws of gravitation; memoirs by Newton, Bouguer and Cavendish, together with abstracts of other important memoirs, American Book Company (1900 ), p. 2. ^ Ferreiro, Larrie (2011). Measure of the Earth: The Enlightenment Expedition that Reshaped Our World. New York: Basic Books. ISBN 978-0-465-01723-2. ^ Maskelyne, N. (1772). "A proposal for measuring the attraction of some hill in this Kingdom". Philosophical Transactions of the Royal Society. 65: 495–499. Bibcode:1775RSPT...65..495M. doi:10.1098/rstl.1775.0049. ^ a b Danson, Edwin (2006). Weighing the World. Oxford University Press. pp. 115–116. ISBN 978-0-19-518169-2. ^ a b Hutton, C. (1778). "An Account of the Calculations Made from the Survey and Measures Taken at Schehallien". Philosophical Transactions of the Royal Society. 68: 689–788. doi:10.1098/rstl.1778.0034. ^ Hutton (1778), p. 783. ^ Archibald Tucker Ritchie, The Dynamical Theory of the Formation of the Earth vol. 2 (1850), Longman, Brown, Green and Longmans, 1850, p. 280. ^ J.G.Mädler in: Masius, Hermann, Die gesammten Naturwissenschaften, vol. 3 (1859), p. 562. ^ Edmund Beckett Baron Grimthorpe, Astronomy Without Mathematics (1871), p. 254. Max Eyth, Der Kampf um die Cheopspyramide: Erster Band (1906), p. 417 cites the "weight of the globe" (Das Gewicht des Erdballs) as "5273 quintillion tons". ^ "Since the geocentric gravitational constant [...] is now determined to a relative accuracy of 10−6, our knowledge of the mass of the earth is entirely limited by the low accuracy of our knowledge of the Cavendish gravitational constant." Sagitov (1970 ), p. 718. ^ Schlamminger, Stephan (18 June 2014). "Fundamental constants: A cool way to measure big G". Nature. 510 (7506): 478–480. Bibcode:2014Natur.510..478S. doi:10.1038/nature13507. PMID 24965646. ^ a b c Saxena, Shivam; Chandra, Mahesh (May 2013). "Loss in Earth Mass due to Extraterrestrial Space Exploration Missions". International Journal of Scientific and Research Publications. 3 (5): 1. Retrieved 9 February 2016. ^ "Fantasy and Science Fiction: Science by Pat Murphy & Paul Doherty". ^ "Earth Loses 50,000 Tonnes of Mass Every Year". SciTech Daily. 2012-02-05. ^ Carter, Lynn. "How many meteorites hit Earth each year?". Ask an Astronomer. The Curious Team, Cornell University. Retrieved 6 February 2016. ^ Durand-Manterola, H. J.; Cordero-Tercero, G. (2014). "Assessments of the energy, mass and size of the Chicxulub Impactor". arXiv:1403.6391 [astro-ph.EP].